I had the privilege of speaking with the well-known scientist and broadcaster Dr David Suzuki when he was in Montreal last week to give a speech at McGill University to promote his latest book called ‘The Legacy: An Elder’s Vision for Our Sustainable Future‘. For over 30 years as the host of CBC’s The Nature of Things, Suzuki has opened the eyes of Canadians to the beauty and fragility of our planet. He is also the co-founder of the David Suzuki Foundation, a non-profit organization that provides science-based education, advocacy and policy work, and acts as a catalyst for social change. 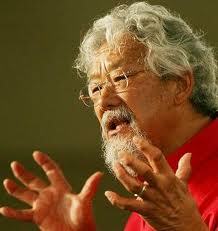 Suzuki’s latest book is a sort of final lecture from a man who has dedicated his life to education and public service. In the book, Suzuki talks about his formative years as a young geneticist as well as the inspiration he has found from Aboriginal societies who have fought for the survival of their lands and traditional ways of life. Now that he is an “elder” as he describes it, the book is also a reflection of Suzuki’s own legacy and his vision for a sustainable future. Click the audio player above to hear my conversation with him (8 mins). The interview can be downloaded by right-clicking here and selecting ‘Save as’ or ‘Save target as’. You can also hear Suzuki’s entire speech at McGill by clicking the audio player below or right-clicking here to download.